Real blood pressure values are reflected more reliably by repeated measurements. During white-coat hypertension the patient's blood pressure level is above the normal in clinical setting. Away from clinical setting, however, the patient exhibits normal blood pressure levels. The phenomenon of white-coat hypertension can be identified during ambulatory blood pressure monitoring. Ambulatory blood pressure monitoring provides a 24-hour profile, which inlcudes a night-time measurement period – an important indicator for cardiovascular morbidity and mortality - as well. Why to Choose a Meditech Ambulatory Blood Pressure Monitor? Meditech offers excellent quality ambulatory blood pressure monitors manufactured in the EU. 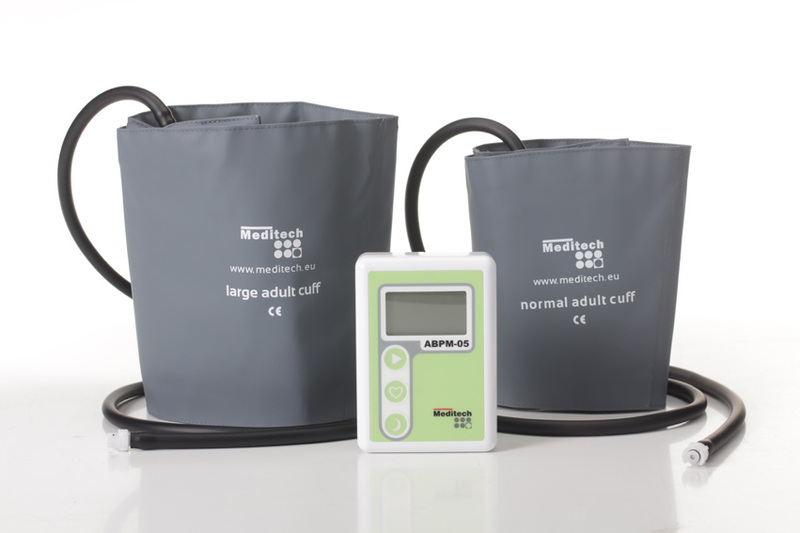 Our ambulatory BP devices are validated to both BHS (British Hypertension Society) and AAMI (Association for the Advancement of Medical Instrumentation) criteria. These independent clinical validations prove the accuracy and the reliability of our 24 hour ambulatory blood pressure monitors. Each Meditech 24 hr blood pressure monitor works with stepwise deflation technique which makes it possible to repeat measurements at different blood pressure deflation levels, which results in shorter blood pressure measurements and higher patient comfort. Waterproof or water-resistant design is being demanded increasingly in medical technology nowadays, because Holter devices – included ambulatory blood pressure monitors – are worn over a 24 hour period. Meditech ABPM-05 ambulatory blood pressure monitor has been successfully tested for vertically falling water drops and it was found to be in conformity with the European Standard 'EN 60529:1991'. ABPM-05 ambulatory blood pressure monitor is rated IP22, so it is protected against insertion of fingers and will not be damaged or become unsafe during a specified test in which it is exposed to vertically or nearly vertically dripping water. 24 hour blood pressure monitors are sold with independent software packages, which present blood pressure data in a variety of ways. Many manufacturers supply individual software solutions, but Meditech provides the software in 2in1 package, with the ambulatory BP monitoring system, no additional cost arise. Moreover, both EasyABPM and CardioVisions Holter BP software can be installed and maintained on several computers at the same time for free. Our Holter BP software solutions provide flexible morning, day, night and special recording periods, freely selectable BP measurement frequency intervals, key statistics in tabular and graphical format, and a printable 24 hr BP report. Meditech ABPM software is suitable both for busy general practices and research purposes.